Kingston Technology, a world leader in memory storage products and technology solutions, announces today that it celebrates its 30th year in the business as an innovative technology hardware provider for computers and devices. Kingston was co-founded on October 17, 1987, by CEO John Tu and COO David Sun. The two co-founders continue to guide the company and remain very active in day-to-day operations. The entrepreneurial spirit of both owners and the success of the company have been recognized globally through the years. Kingston’s core tenets of respect, loyalty, flexibility and integrity have created an exemplary corporate culture — one that guides its relationships with customers, partners and vendors, and to which Kingston owes its success. The company continues to be the largest supplier of DRAM modules among non-semiconductor manufacturers and a leading maker of Flash memory products — especially SSDs — where it has become a dominant force among consumers and organizations alike looking to upgrade existing systems and data centers. A video celebrating 30 years can be found here. Kingston manufactured just one product when it started in 1987 and has steadily and strategically evolved as a company by controlling as much of the production cycle as possible — from initial wafer processing through finished product — for both DRAM and Flash. The company has done this through expansion, strategic investments, partnerships and adapting to industry needs as early as possible. Seeing SSDs as the future for hard drives in both client PCs and data centers, the company began offering SSD products in 2009 and last year analyst firm Forward Insights cited Kingston as the second-largest supplier of SSDs in the channel. The company also saw the growing demand for smart phones, tablets, IoT-based devices and wearables. In 2010, it formed Kingston Solutions, Inc. (KSI), which manufactures embedded memory products (single-chip storage and controller solutions) that go into lighter and thinner everyday consumer devices. Today, KSI is the leader in embedded solutions for second-tier smart phone manufacturers. The product portfolio has further expanded in recent years to headsets, keyboards, mice and mouse pads via its HyperX gaming brand, and the innovative products have rapidly gained accolades and acceptance among professional gamers and pro sports athletes. It took only two years for HyperX to ship its 1-millionth gaming headset. Today, Kingston through all its brands and product categories offers over 2,000 quality technology solutions and ships to more than 120 countries. It is a widely recognized and accepted brand known the world over. 1987: Kingston begins operations in Orange County, Calif., with a new Single In-Line Memory Module (SIMM) that creates an industry standard for memory modules. 1992: Kingston is ranked by Inc. magazine as the fastest-growing privately held company in America. 1995: Kingston opens its first overseas office in Munich, Germany to better provide support to its European customers. 1995: Kingston joins the Billion-Dollar Club as sales exceed $1.3 billion (USD). 1996: Kingston and Toshiba co-Market memory upgrades for Toshiba PCs. This is the first time ever that a PC OEM and a memory manufacturer teamup. 1997: Kingston expands its global footprint as it establishes the headquarters for Asia-Pacific operations including a manufacturing facility and offices in Taiwan. Kingston also opens its first office to serve South American customers in Brazil. Its European headquarters move to the United Kingdom and a manufacturing/logistics facility in Dublin, Ireland is opened. 1997: Kingston Technology Services Division (KTSD) is formed to exclusively work and manufacture memory solutions directly for OEM customers such as Dell. 1999: Kingston purchases a controlling interest in Powertech Technology, Inc., now the world’s largest back end wafer and chip packaging and testing facility for both DRAM and Flash. The purchase further strengthens Kingston’s ability to control all facets of the memory-manufacturing cycle from wafer to finished good. 1999: Kingston strategically opens its Mexico office to support a growing region. 2000: Advanced Validation Labs, Inc. (AVL) is launched as an independent memory testing and validation lab. Its “one-stop shop” services cover component level to module testing to support the entire memory industry. 2000: Payton Technology Inc. is established to help manage Kingston’s memory supply chain as well as supply back end wafer processing services making the company more efficient in delivering memory solutions to its rapidly expanding client base. 2001: Kingston begins assembling memory modules in Shanghai, China. 2002: HyperX begins with its first product, high-performance memory modules. 2003: Kingston begins shipping Flash memory products. 2004: iSuppli (now IHS Markit®) ranks Kingston as the world’s No. 1 memory module manufacturer for the third-party memory market, a streak that has continued each year to date uninterrupted. 2005: Kingston opens the world’s largest memory module manufacturing facility in Shanghai, China. 2006: Kingston revenue reaches $3 billion (USD). 2009: Kingston’s Asia-Pacific region reaches the $1 billion (USD) mark in sales for the first time. 2010: Kingston and Phison Electronics Corporation form Kingston Solutions, Inc., a joint venture manufacturing embedded memory products for the emerging mobile industry. 2010: Kingston revenue reaches a new record high of $6.5 billion (USD). 2013: Gartner Research ranks Kingston as the No. 1 USB manufacturer for the 6th straight year. 2013: Kingston ships the world’s largest and first 1TB USB Flash drive. 2014: HyperX launches its first gaming headset. 2016: HyperX sells its 1-millionth headset. 2017: Kingston ships the world’s largest and first 2TB USB Flash drive. 2017: Kingston ships the second-most SSDs in the channel in 2016 according to Forward Insights. 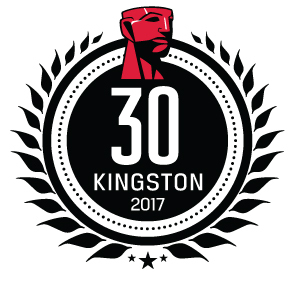 2017: Kingston celebrates its 30th anniversary on October 17.